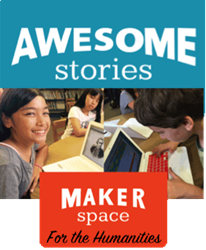 AwesomeStories MakerSpace for the Humanities now provides an e-portfolio making progress in writing, research and critical thinking visible for students, teachers, parents and administrators. Now students use WriteFolioTM- to show progress and to display their array of multimedia writing. I never expected to be able to see a student’s writing progress so easily or so completely! In the scramble to meet student writing and research needs for Common Core State Standards and 21st century careers, educators struggle to piece together solutions. Now, AwesomeStories announces WriteFolioTM, designed to meet the needs of teachers, students and district and school writing departments. WriteFolioTM is a new app in the MakerSpace for the Humanities suite that supports instruction, writing and authentic assessment with its online portfolio. “I never expected to be able to see a student’s writing progress so easily or so completely!” exclaimed Polk County Public Schools Director of Writing, Diane Plowden. WriteFolioTM works seamlessly with AwesomeStories’ archive of almost 5,000 stories that introduce K12 topics across the curriculum supported by 100,000+ primary sources, enabling students to engage in research to fuel and deepen their non-fiction and fiction writing. MakerSpace for the Humanities, with this new e-portfolio app, now supports the entire research and writing process from teacher prompts to student research, writing, citing, multiple revisions, final grading by rubric, publishing the multimedia writing on the website and inclusion in the student’s WriteFolio. To join call 800 277 1381 or email chris(at)awesomestories(dot)org. STEM and STEAM are critical, but so are the Rs! Research, Reading, Recommending, Reflecting and wRiting are equally important skills for 21st-century life. Adding the Rs to STREAM, AwesomeStories combines cross-subject topics and reliable evidence in an archive of nearly 5000 stories - all in context and supported by 100,000+ primary sources. Its suite of apps - MakerSpace for the Humanities - enables teachers and students to research, write, cite, publish and track progress.